Diesel-lovin’ Audi is slowly, slowly coming to grips with this whole hybrid thing. Earlier this year, the “We’re not against hybrids” automaker finally gave out some real information about its hybrid Q5 (after years of teases and killing the program once,) and we saw the A6 hybrid at the Detroit Auto Show in January. Today, Audi is making good on the promise it made at the Geneva Motor Show in 2010 when it showed off a thinly disguised hybrid A8 concept. 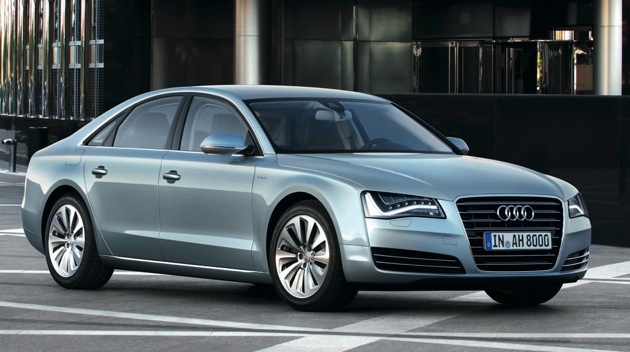 Due out in 2012 (coincidentally, the 15th anniversary of the Toyota Prius), the A8 hybrid should appeal to customers who crave the German automaker’s style and dislike stopping for petrol every third day. The A8 hybrid uses a 2.0 TFSI engine and an electric motor to crank out a peak output of 180 kW (245 horsepower) and 480 Nm (345.03 lb-ft) of torque. Audi says all that power and style will come with 37 mpg (U.S.), which doesn’t put the A8 at the top of the hybrid efficiency pack – remember, the A8 is huge – but it beats the pants off of the gas-only A8, which the EPA rates at 18/28/21 (city/highway/combined) mpg.